What happens during a Thread Lift treatment? When receiving NovaThreads at Faces of South Tampa, our medical injectors make a small poke-through with a needle and then the threads are injected. When the threads are inserted, they run parallel to the surface of the skin just underneath the layer to the desired location. The needle is removed, and the thread is left suspended in place to lift the skin. 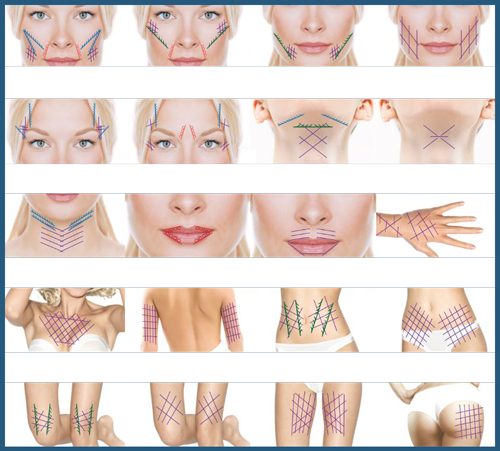 When the threads are inserted, they cause the body to produce inflammation, which then signals the body to boost collagen production to send to the “wounds.” This is how the targeted areas increase facial volume as well as volume on other parts of the body that would benefit from increased collagen. How soon will I see results? How soon will I see results? Results are immediate. Results will also continue to increase over the next few months as the body fully absorbs the threads. The results typically last between nine and 15 months. NovaThreads (Thread Lift) is typically referred to as a "non-surgical facelift." With NovaThreads, this method is possible by means of a non-surgical lifting technique to treat areas of the body that start to sag as you get older. 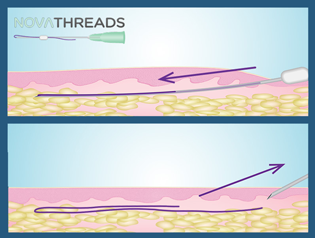 NovaThreads are hypodermic needles that comprise of an absorbable suture made of Polydioxanone (PDO)… which have been used in procedures, such as open-heart surgery, for years making it very safe to introduce to the body.